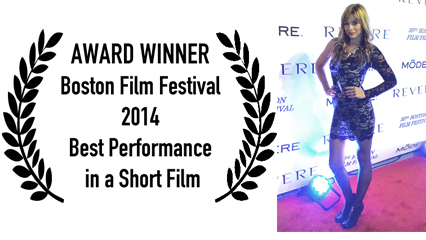 On September 27th, 2014, “Committed” premiered at the 30th Annual Boston Film Festival. The screening, which was held at the Revere Hotel in Boston, was extremely well attended and the overall response to the shorts that played that afternoon was fantastic. Director, Mehran Torgoley, Producer Kevin Pardo, and Actress/Writer Llana Barron were in attendance on the red carpet. A week after the festival came to an end, winners were announced in various categories, one of which “Committed” was honored to receive. The “Best Performance In a Short Film” was awarded to Llana Barron for her portrayal of the character, Evelyn, a strong willed nurse in the 1950s. This is the 6th award for “Committed” since it began its run on the film festival circuit in September.